Nestled in among the many great little shops and restaurants along the shores of Lake Michigan in Grand Haven, MI is an amazing little shop called Blueberry Haven. The feature of our very first vendor in our “Meet our Vendor” series, Blueberry Haven is a quaint shop owned and operated by a wonderful lady named Tiffany Balk. A passion for family and blueberries led her to create this tasty gift to all the visitors and residents of Michigan. One of our very first vendors, she became part of our store when we were still in the dream phase, (the phase where we thought we had a lot but really, had NO clue). She offered us back up and assured us that she wanted us to do great things! Well, thanks to fantastic vendors like Tiffany, we are! So here is more about this wonderful Michigan store and all it has to offer you in Grand Haven and right here at Tip’n the Mitten. Tiffany Balk came up with the idea while driving home from a vacation in Canada. She wanted to send someone a gift and wondered what it should be. Why not send a gift of Michigan cherries, her husband suggested. Balk thought to herself, “Why not blueberries?” After all, southwest Michigan produces 44 percent of the blueberries on the U.S. market. A single idea led to a delicious line of products, and something that reminds everyone who has visited, of West Michigan. While we only have a small portion of all this great store has to offer, we are proud and happy to be able to say you can find at least some of what makes Blueberry Haven so ‘GRAND’ right in the heart of northern Michigan. 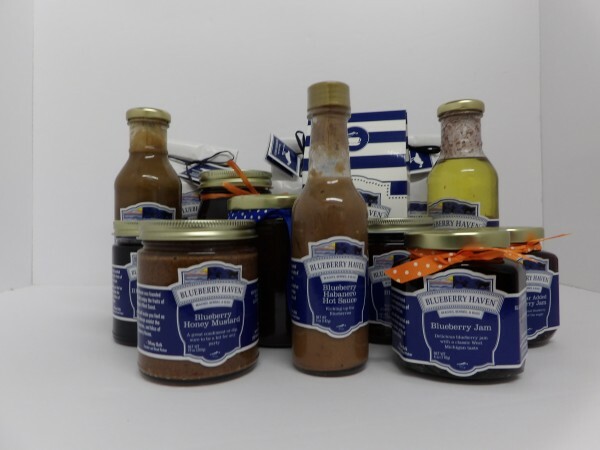 Choose from blueberry hot sauce, chocolate sauce, coffee, blueberry butter, muffins, pancakes and much more. A store favorite are the Cinaberry Pancakes! Filled with blueberries, this great mix comes with enough mix to quench your desire for blueberries and provide more than one meal, what more can you ask for? Of course, if you are ever in Grand Haven in far southwest Michigan, be sure to stop by at Blueberry Haven and say hello! You can find them online at blueberry-haven.com or check out their actual storefront at 213 Washington Ave, Grand Haven, MI 49417.